Happy Birthday, dear Willie Boy! We’d be lost without your fantastic plays! 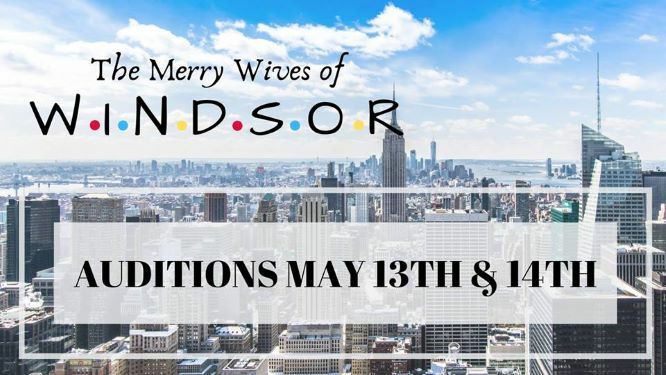 Audition appointments for this summer’s THE MERRY WIVES OF WINDSOR are beginning to fill! By appointment only. Please email aurorajculver@gmail.com to set up your appointment to audition for Shakespeare in the Hills 2019. Details for your audition will be emailed to you. Thank you! You can do a monologue from any show, for any role or gender. Does not need to be memorized. Auditions May 13th and 14th by appointment. Callbacks May 15th by invitation. Show rehearses May 23th -July 18th. Performances will be July 19th-August 3rd, 2019. Actors not only perform but also act as crew members. Everyone is expected to be present for his/her performance evenings and participate in setting up the show. We must set-up and breakdown the set each night. It is a team effort where each person is assigned a few tasks. It’s a lot of fun! Thank you so much to all of our audiences who attended SHAKESPEARE IN THE HILLS’ The Comedy of Errors! We had a blast performing for you- it was a joy to hear your laughter and applause, and to hear your thoughts after the show. Seeing returning audience members was wonderful, as was having new people attend our shows for the first time ever! A huge thank you to our cast, crew, the support of Laguna Hills Community Center, local businesses that supported us, and volunteers from the community. Theater is only possible when people come together to create and lend a hand- thank you for being a part of it. Putting together shows for SHAKESPEARE IN THE HILLS these past six years have been a joy, and we hope you’ll join us again for future productions. During the year you can follow us and read more about our activities. Thank you for coming to see the show- we’ll see you again soon! SHAKESPEARE IN THE HILLS’ The Comedy of Errors has only two more performances – Friday, August 17, and Saturday, August 18 at 7 p.m.
Last, but not least, we asked Founder of On the Edge Theatre Productions and Director of The Comedy of Errors – Aurora J. Culver – a few questions about her passion and vision for this year’s production. What made you choose to direct The Comedy of Errors? Whenever it comes to choosing the Shakespeare show to direct for the summer, it’s usually because an idea or concept got stuck in my head and I just have to bring it to life. With The Comedy of Errors, it was no different. I wanted to do a lighthearted comedy after directing Romeo & Juliet, and the concept of doing it in the style of vaudeville just seemed like the perfect coupling. Soon as I had that in my head, different ideas for the show came forward- it was time to bring it to life! The world we’ve created for this show is a 1930s Vaudeville troupe performing their take of a Shakespeare show. Each performer is a different archetype of the types of performers of the day- the magician, the musician, the dancer, the comic duo. I wanted to make that come to life from the very beginning, so our preshow consists of those performers taking the stage and doing their routine before the actual play begins. When you come to see the show, you may wonder why our “twins” aren’t identical. I decided early on that I wanted to have physically different twins- only for their outfits and performances to mirror each other. I did this with a desire to reflect on how regardless of our looks, the similarities we have within humanity are what is important- we are each a part of this “brotherhood of man,” and all part of God’s creation. Another decision I made for my show was to seek out a diverse cast of performers. I love the diversity of this community, and wished to have that reflected by the cast. I will strive to continue this in my productions- it was such a blessing in Romeo & Juliet, and an important change to strive for. What was your first exposure to The Comedy of Errors? My first time seeing The Comedy of Errors was with my sister in the role of Dromio, with my mom directing the play. It was a production of junior high students- but each of them was so dedicated to their craft that it far surpassed expectations of what kids can do. How does the venue affect how you stage the show? Staging a show outdoors is full of many challenges- volume, weather, and even wildlife can come into play! With the gazebo and town green area where we stage our shows, the overall seating for our audience is quite big as well. Actions are larger and more physical, and reactions more over the top. We strive to find moments to go out and through the audience, to connect with them and bring them into the play. The play space available is large, and using it to its fullest potential is what I aim for! What are the challenges of directing Shakespeare? Of directing outdoor theatre? I love working with Shakespeare’s plays- delving into them I find something new every time. The challenges come when trying to get a concept across from the text that our modern society doesn’t understand- whether that’s a relationship between characters, a particular phrase used, or someone’s reaction to a situation. But I love bringing those up with the actors and working with them to help create the best choices to tell the story fully. Directing outdoors the biggest challenge is making sure the actors are heard and seen. We work every rehearsal to address those things. Some of the work is trying to address more difficult moments early on in the rehearsal process, and building up each actor’s skills from the beginning. Why do you produce SHAKESPEARE IN THE HILLS each year? Every time I bring a production to Southern Orange County, I have someone come up to me to say this was the first time they’d ever seen a Shakespeare play- or that this was the first time they’d ever understood one. There isn’t many opportunities to see Shakespeare in the area, but we have hopes it will continue to increase! Whether it’s a comedy or a tragedy, traditional Shakespearean dress or a high concept production, my goal is to create an experience that audiences enjoy, understand, and are excited for. What was the first piece you ever directed? The first show I ever directed was “Hard Candy” by Jonathan Rand. When did you first decide to pursue directing? I first decided to pursue directing when I was in college- I was intrigued by the idea and began to grow my knowledge, experience, and confidence. If you had all the resources in the world, what would you most like to direct? I would most like to direct one of Tom Stoppard’s plays. His writing is brilliant and each of his plays I connect with- from the believable lives of his characters to his witty dialogue to the truths he writes about our world. What director do you look up to and why? McKerrin Kelly, whom I’ve had the pleasure to assistant direct for, is an inspiration and fount of knowledge and experience. Watching her work with actors is to see the perfect blend of creativity and heart. It is a joy to watch her get the best out of the people she works with, and help them reach their full potential. A morning at church, brunch with the husband, and possibly seeing a show or relaxing at home. What do you do when you’re not doing theater? I’m not sure there is a time when I’m not doing theater! If I’m not involved with a theatrical production in some capacity, I am possibly working on something in the film world. Aurora J. Culver (Director) has had a blast creating this vaudeville version of The Comedy of Errors. With her company On the Edge Theatre Productions (www.otetheatre.com) she has directed shows such as Into the Woods, Romeo and Juliet, and The 39 Steps. Other favorite projects include directing for Unbound Productions in Alta Dena, co-founding a live radio play series inspired by the podcast Earbud Theater, and directing her first feature film TO THE NEW GIRL. Special thanks to all involved- the cast for bringing their talent and creativity into everything; the crew, artists, and builders who contributed to this show in various ways; and the continued partnership with the Laguna Hills Community Center. Aurora would like to thank her husband Kenny and her family for their encouragement. Thanks be to God. The Comedy of Errors is down to its last two performances this coming Friday, August 17, and Saturday, August 18 at 7 p.m. at the Laguna Hills Community Center. What’s the last thing you do before you step out on stage? “Deep breath then smile like you mean it,” Rachel Trant, our Master of Ceremonies for this year’s SHAKESPEARE IN THE HILLS’ The Comedy of Errors. Our lovely Master of Ceremonies is played by Rachel Trant in SHAKESPEARE IN THE HILLS’ The Comedy of Errors returning to the Laguna Hills Community Center this Friday, August 10, at 7 p.m.
What are the roles you are playing in The Comedy of Errors? I am the Master of Ceremonies, Solinus the Duke of Ephesus, and Luce. Mostly the language of Shakespeare and trying not to emphasize the rhymes. Because I love Shakespeare yet have not performed in one. Also Comedy of Errors is one of the few Shakespeare plays I hadn’t read before. We are putting a Vaudeville spin on this Shakespeare play. Jennifer Hedgecock, my Shakespeare teacher, because Comedy of Errors was one of the plays we didn’t read in class. I love the Master of Ceremonies the best because of the outgoing character and how I’ve been given such freedom with creating it. I’m getting my degree in English to become a high school teacher. I started performing on the stage about four years ago. Practicing lines or joking with my cast mates. Going to school or writing. Last performance was in the ensemble of Legally Blonde. Rachel has also been in productions of The Importance of Being Ernest, A Child’s Christmas in Whales, and various premieres of productions at the Camino Real Playhouse. David Cromer plays “Antipholus” of Syracuse in SHAKESPEARE IN THE HILLS’ The Comedy of Errors opening this Friday, August 3 at the Laguna Hills Community Center. Anyone who thinks that a wedding would be improved by a laugh track and no moment is too serious for a pratfall. The challenge for me is that I’ve always played a very specific sort of role in very specific sorts of plays. The focus of this play is not on an emotionally catastrophic clash of personalities or circumstance, nor do we dive too deep into the meaning of love, betrayal, companionship; no one is brutally murdered. That’s a shift in my experience. This means that a singular amount of energy must be put into the individual moments of the show. Making each of them their own fully formed beginning, middle and end. Making them carry themselves through the innumerable skits and sketches that weave this absurd plot together. In short, making them what I am told should be called “funny”. When they removed the bear trap from my ankle I was informed that I had a choice between a future in the theatre or something called “The Trial of Seven Scarves”. I’ve never been able to properly work a scarf, I blame a lack of British ancestry, so here I am. In Addition to that, Aurora is a wonderful artistic partner and a talented director. Working with her is an informative, engaging, delightful experience. Memories of this honestly stated honor will last a while longer than the trap scars. The vaudevillian theme is a wonderful addition. Taking the very segmented humor of this play and putting them into the context of a variety show works extremely well. It showcases the tone of each scene on it’s own while painting the larger picture in the background, and allows the comedy to shine and connect with the audience in a way that is colorful, unpredictable, and entirely unique. You know who you are. You always know. Antipholus is a relatably clueless opportunist who bumbles his way through one poor decision after another and, at the end, still manages to meet his original stated goal. In this way he’s… Huh. I may need to rethink some things. To be entirely honest I do see a bit of myself in the character. He is a romantic who is surprised by romance. A fool and an odd sort of friend. A man on a mission who gives into the world around him perhaps just a bit too easily. How is he different? For one, I am far better looking. And… well, just about everything else. I love the freedom his foolishness allows. It is a change of pace and not necessarily comfortable at all times but the shift is refreshing. You don’t get to harness your inner fool nearly often enough when the world is marred by silly things like public decency laws. Letting myself try to be funny as someone who isn’t me. I’m not funny. I mean, I’m funny when I’m myself, but I’m pretty terrible at being another funny person in addition. I like to think I’ve accomplished about 15% of another funny person with this part and for that achievement I’m pretty proud. Paul Giamatti. I want to see how this character could possibly make me ponder the bittersweet nature of life’s misfortunes. Right now I have aspirations towards the titular “Macbeth”. What can I say, I’d love to do another comedy. A musical with my church entitled “The Grumpy Shepherd”. I… was said shepherd. I’ve been typecast ever since. That is incredibly hard to narrow down. To make it easier on myself I’m going to restrict the answer to Shakespeare plays in which case I have an easy answer: Tempest. The irreplaceable Aurora, what with her vision and respect for pandering and clever use of outdated bear trapping methods to hunt the ultimate game. I have trouble answering this one with any sort of accuracy. The fact of the matter is that I look up to anyone who can make this pursuit of artistic truth their life’s ambition and labor. I’m also terrible with names, so you’ll have to settle with a wide blanket of respect. Attempting to replace the 4lbs 7oz of water weight I’ve lost in the last hour. Cracking (un)wise. General hijinx sprinkled with productivity. I’m going to have to go with Kaitlin. Plotting, scheming, creating. In general. If I had a magic wand, the next show I did would be a press conference to reveal my arcanic might and declare myself ruler over the mystic arts and mortal realms. Probably Tempest after that. Repeat a continual stream of increasingly creative curses and imagine the worst thing that could possibly go wrong. Then, you know, make funny. David Cromer is a recreational performer at best whose credits include more that he would prefer be forgotten than he’d like to be remembered. Among the latter are recent endeavors, including “Claudius” in Hamlet, “Brutus” in Julius Caesar, “Demetrius” in A Midsummer Night’s Dream, and “Feste” in Twelfth Night. A passion for the creative arts was sparked at an early age when a song he sang in his youthful falsetto soothed a small child to sleep in her mother’s arms during a church performance. Seeing the sweet peace of music, the power of expression without need for words or comprehension bestowed an understanding. What makes art is a universal energy that manifests before the ability to make a painting or take a step or say a single word. It is an attempt to catch the wonder of curiosity in a teacup, to tame the great ‘What If’s. It is a way to make the world more wonderful. That sort of nonsense rattling around in his skull, David somehow stumbled twenty-odd more years forward until he landed on stage right around the moment you reach the end of this sentence. He presently manages a fledgling Shakespearean company of his own, BS Theatre. He is also involved with an independent production company, Cidonia Productions, and besides all that is an occasional audience member himself. We are thrilled to have Mario Arciniega return to SHAKESPEARE IN THE HILLS this year playing “Antipholus of Ephesus” in The Comedy of Errors opening this Friday, August 3 at the Laguna Hills Community Center. I think anybody who loves physical comedy and screwy mix-ups will absolutely love this show! I like the amiable vibe. It’s great getting away from LA every once and a while and just having a fun easygoing time that the company brings. That I’m able to make it a physical role! It’s so much fun. Finding the right story arc pacing for him. I feel, if done right, he can definitely be hilarious depending on when I delicately pick and choose when to explode with him. “Iago.” I would love to play a more manipulative villain. Pterodactyls by Nicky silver. I love dark comedy. Thomas Bauer. I strive for the excellence that he has achieved. I dare anyone to challenge me when saying David Cromer is the funniest person, hands down. Clever, witty, and dorky, his humor is good for all ages. I try to go through the different breaths my character would be taking during the show depending on his emotions. Mario Arciniega is an East Los Angeles actor who has many experiences performing Shakespeare with characters like “Benedick,” “Demetrius,” and “Lucio” under his belt. Taking many Shakespeare and Improv classes he hopes to one day perform at the Shakespeare Oregon Festival and Griffith Park. Mario would like to thank his Mom and Dad for pushing him to keep going, his brother Thomas for always setting the bar to which he hopes to achieve, and Alexis Tapia for always being there to run lines and encouraging him to do better. Kristington Plotkin makes their debut with SHAKESPEARE IN THE HILLS as “Dromio of Ephesus” in The Comedy of Errors opening this Friday, August 3 at the Laguna Hills Community Center. What’s challenging about bringing this script to life? There’s a lot of violence and it’s 2018. Why did you want to be involved in SHAKESPEARE IN THE HILLS? I really wanted to work with Aurora as a director after experiencing her as a cast member in Twelfth Night as part of bS theatre. She was a joy to work with then and is one now too. How is this production bringing something new to this story? I think the camp sensibilities of this cast are a little more wacko than most interpretations. There’s also a lot more equality of violence than was intended, I think. What’s going to surprise people about this show? If they can tell any of the twins apart. Call someone out by name: who must come see this production? My mom, but I feel like that’s cheating. Andy Mallett, but I feel like that’s also cheating. How is this character like you? Dromio and I both know how to take a lot of crap. Different? All my abuse has only been emotional. What do you love about this character? He’s so pitiable and it’s so fun to play. What’s the biggest challenge about taking on this role? Finding moments to mirror the other Dromio. Besides yourself, what celebrity would you like to see tackle this character? Danny Kaye, but I’d like to see him in everything. Without giving anything away, what’s your favorite line of dialogue? The “I am not Adriana” speech is so much fun. I love it when characters are trying to make it less obvious how much they want something. If you could play any other Shakespeare character, who would it be? “Viola” in Twelfth Night, “Beatriz” in Much Ado, and “Bottom in Midsummer are roles I plan on fulfilling one day. One day. When did you first perform? I don’t have memories of this, just footage, but I think I was fire in the Temple Torah plays as a preschooler. My first actual memory of being in a show was the 13 Colonies in 5th grade as Sybil Ludington (too bad her name doesn’t rhyme like Revere). Besides this one, what’s your favorite stage show? Natasha, Pierre, and The Great Comet of 1812. It completely changed how I think about theatre. Who do you look up to (as an actor/director/etc.)? Rachel Chavkin is my favorite director now. I drove from here to Edmonton, Alberta, Canada to see a new show she’s working on. She pushes to include what I feel like is the missing piece in a lot of theatre I see – involving the audience and keeping them engaged and active. Acting lately is harder for me to pin down. I got a lot of people I admire. As a general entertainer I think Danny Kaye is the bees knees. What’s your perfect Sunday afternoon look like? A full day at the ren faire where I don’t have to leave in the middle for work. Who’s the funniest person in the cast in real life? I don’t know the rest of the cast that well yet but Cromer always makes me laugh. What do you do when you’re not doing theatre? Desperately attempt to fill the hole in my heart through other creative mediums. If you had a magic wand, what show would you do next? Natasha, Pierre, and the Great Comet of 1812. I’m obsessed, I tells ya. Plus I’m super salty about how short it’s Broadway run was. What’s the last thing you do before you step out on stage? Try to remember what happens to my character before I step on stage. Kristington is a perpetual dabbler – probably the result of being told they could do anything from a young age. Their playwriting career started in high school, which paved the way for the need to act and direct. Since then, Kristington has produced several audio dramas, been artistic director for 3 theatre groups, and performed in various mediums over the past ten years. Favorite roles include “Logainne Schwartzandgrubenniere” from the 25th Annual Putnam County Spelling Bee, “the Witch” in Into the Woods, and their yearly commitment to the Washerwomen Guild at the Renaissance Pleasure Faire. If you’re a fan of profound onology and seeing a scattered array of talents, visit Kristington.com. We’re excited to introduce Gloria Henderson who is making her debut as “Emilia”, “Balthasar”, and “Officer 2” in SHAKESPEARE IN THE HILLS’ The Comedy of Errors opening this Friday, August 3 at the Laguna Hills Community Center. What’s challenging about bringing this script to life? This is my first non-musical since returning to theater several years ago, so there are a lot of lines to remember without music involved. Plus it is hard not to laugh on stage as this is a funny comedy! How is this production bringing something new to this story? The interpretation…you will need to come and see it! Call someone out by name: who must come see this production? There are too many people to name…if you love Shakespeare, want to understand Shakespeare better, or simply love to laugh, then this show is for you! How is this character like you? Different? Emilia, like me, is matter-of-fact and sarcastic. She loves to be in charge. She is much more serious than I am though and I am far more nurturing. What do you love about this character? I love how Emilia is on her high horse even though she has made a lot of mistakes. Who she was and who she is are not the same. She has secrets. What’s the biggest challenge about taking on this role? I want to sing my lines. If you could play any other Shakespeare character, who would it be? I would love to play Katherine in Taming of the Shrew. What do you want to be when you grow up? I am already grown up. However, if I were to have a dream career, then I would love to open up a school that truly individualizes instruction and meets the needs of those who value and desire education in fun and meaningful ways. If someone was going to make your life into a movie, who would play you? I love Sandra Bullock although she’s about a decade older than me so that may not work. Honestly, not sure since Asian actresses are limited. When did you first perform? I was really little. I used to sing solos for church and we had a lot of school performances. Besides this one, what’s your favorite stage show? My last show was Pirates of Penzance. I would have to say that playing Ruth with that particular cast and directors at the Attic was the best experience I have had thus far. Who do you look up to (as an actor/director/etc.)? There are too many to name. I admire those who are less consumed with themselves and who value their family and friends. When you have a five-minute break during rehearsal, what do you spend that time doing? I tend to snack, chat, or run lines. Who’s the funniest person in the cast in real life? I would have to say Kaitlyn. What do you do when you’re not doing theatre? I am a mom and a teacher. I am very busy between family and work. If you had a magic wand, what show would you do next? Just one? Now that’s too hard to choose! For now, I would say Donna in Mamma Mia! or Velma in Chicago. What’s the last thing you do before you step out on stage? I say a prayer. Before that, I eat a banana. Both are great for the nerves. This is Gloria Henderson’s first non-musical since returning to theater several years ago. She finds Shakespeare challenging and rewarding. Her most recent role prior to joining the cast of The Comedy of Errors was “Ruth”, the Piractical maid-of-all-work, in Gilbert and Sullivan’s Pirates of Penzance at the Attic Community Theater. She loves sharing the stage with her family and friends and hopes you all enjoy the show! Special thanks to Aurora Culver for her direction!